The identification of classifiers and predictors of psychopathology that are based on brain functions has remained elusive due to limited insight into the neurobehavioural mechanisms underlying behavior. Here we present data from the longitudinal imaging genetics project IMAGEN of 2000 adolescents who have been assessed at age 14, 16 and 19 years (Schumann et al. Molecular Psychiatry 2010). Starting from a neuropsychosocial model of prediction of adolescent alcohol abuse (Whelan et al. Nature, 2014) we willdiscuss several published and unpublished neurobehavioural studies that discovered brain mechanisms underlying impulsiveness (Whelan et al Nature NS 2012), reward anticipation, the relation of gene expression and brain functional activity (Richiardi et al. Science 2015), as well as investigations measuring the effect of alcohol on brain development. We will present a model that allows integration of the different modalities investigated while maximizing correlation between biological mechanisms and observable behavior using sparse canonical correlation analysis. We propose that a combination of thorough neurobehavioural investigations with advanced statistical models will result in the development of robust multimodal biomarker profiles for clinical application. Dr. Gunter Schumann is the professor of Biological Psychiatry and Head of the Section at the Social, Genetic and Developmental Psychiatry Centre (MRC), and Honorary Consultant at South London and Maudsley NHS Foundation Trust (SLaM), working at the National Psychosis Unit. Before joining the IoP in 2005, he was trained (postgraduate) and worked at Harvard University, at the University of Freiburg and at the Central Institute of Mental Health, University of Heidelberg, Germany. 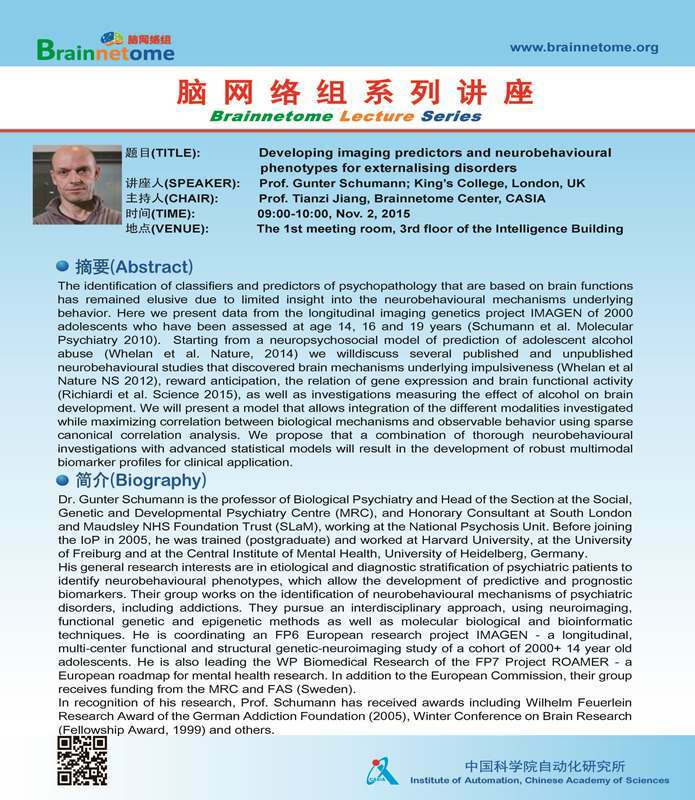 His general research interests are in etiological and diagnostic stratification of psychiatric patients to identify neurobehavioural phenotypes, which allow the development of predictive and prognostic biomarkers. Their group works on the identification of neurobehavioural mechanisms of psychiatric disorders, including addictions. They pursue an interdisciplinary approach, using neuroimaging, functional genetic and epigenetic methods as well as molecular biological and bioinformatic techniques. He is coordinating an FP6 European research project IMAGEN - a longitudinal, multi-center functional and structural genetic-neuroimaging study of a cohort of 2000+ 14 year old adolescents. He is also leading the WP Biomedical Research of the FP7 Project ROAMER - a European roadmap for mental health research. In addition to the European Commission, their group receives funding from the MRC and FAS (Sweden). In recognition of his research, Prof. Schumann has received awards including Wilhelm Feuerlein Research Award of the German Addiction Foundation (2005), Winter Conference on Brain Research (Fellowship Award, 1999) and others.